B. DàVida Plummer, Dean of the Scripps Howard School of Journalism and Communications; Liz Carter, President and CEO of The Howard Scripps Foundation; Dr. Battinto Batts, Director of the Journalism Fund; and Karen Hite, Director of Talent Acquisition. This annual event commemorates the Hampton University’s longtime partnership with The Scripps Howard Foundation. 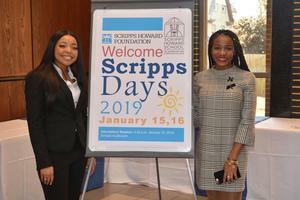 It also celebrates the impact the Scripps Howard Foundation has made on the Scripps Howard School of Journalism and Communications since its $10 million gift in 2002. Honored guests from The Scripps Foundation included Liz Carter, President and CEO of The Howard Scripps Foundation; Dr. Battinto Batts, Director of the Journalism Fund; and Karen Hite, Director of Talent Acquisition. The guests met current Scripps students, visited classrooms while in session, and attended a presentation where a video was shown highlighting various students and their accomplishments. There was also a question and answer session held where students asked the Scripps Howard delegation on tips on how get ahead in the journalism field. Each member of the Scripps team doled out important advice to Scripps students, but the one piece of information highlighted throughout the session, was honing great writing skills was absolutely key in the journalistic world, no matter the actual job. Liz Carter, President and CEO of The Scripps Howard Foundation, was incredibly impressed with the students, and truly enjoyed the entire day. “One of the highlights of what we do is being able to go out and meet the students who are going to be the one who carry this industry into the future. We see them bringing their unique perspectives to the journalism profession, and their unique talents. They bring an understanding of things that are enduring, like the ethics of journalism and the qualities that ensure journalism created is meaningful. Those students will carry the profession forward,” said Carter. Scripps students also enjoyed the day’s festivities, including the presentation and Q&A session. “I thought the presentation was extremely enlightening. I feel that it’s extremely important for us as Scripps students to know what The Scripps Howard Foundation has to offer. We definitely got insight into the industry and all the things we need to know as students, especially as African American students, since they are going to diversify media outlets and the industry,” said Kimberlee-Mykel Thompson, freshman, strategic communications major from Winston-Salem, North Carolina. 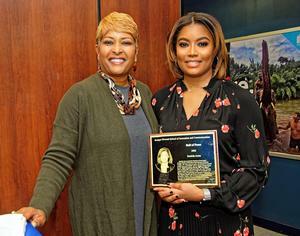 The evening reception was followed by a special ceremony to induct Hampton University alumna Rashida Jones (’02) into the Scripps Howard School of Journalism and Communications Hall of Fame. Ms. Jones has had a very lucrative career in the journalism industry. She is currently the Senior Vice President of Specials of NBC News and MSNBC, and is in charge of programming for the network’s digital streaming network signal. Her industry credits include news director of WIS-TV, director of live programming and executive producer for The Weather Channel, and producer for WTKR-TV. After the induction ceremony for Ms. Jones, all the guests were invited to watch a live broadcast of the student-run newscast, WHOV-TV Scripps News Watch. 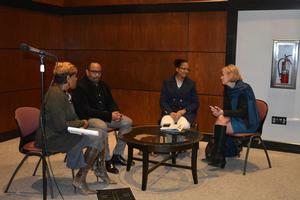 Students also got the chance to interview for internships with The Scripps Howard Foundation.